Canada Customers - Click Here for a list of Preferred Vendors in your area. All Stainless Steel. 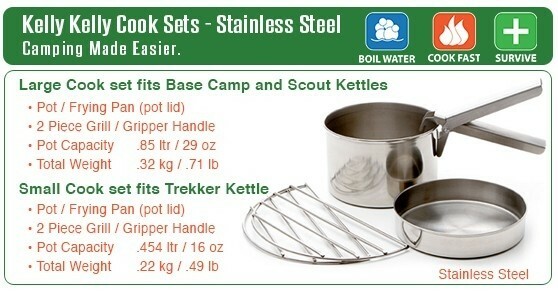 The Cook Set enables our Kettle to be turned into a portable cooker eliminating the need to carry fuel on your trips. Cost-Free, Carbon Neutral, Eco-Friendly cooking! Set fits inside base of Small Kettle for transport. Pot Support NOT included. Enjoy cost free, Carbon-neutral cooking outdoors using whatever natural fuels are available. 1. When the water boils, remove the kettle from fire base and place Grill Pieces (2 no.) onto the fire-base. Then simply place your Pot/Pan on the Grill pieces for cooking, adding additional fuel to the fire base as required. Fuel can be inserted through the air hole in the side of the base. 2. 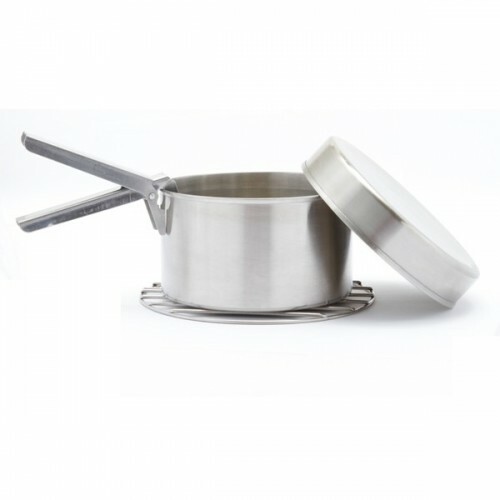 Using our Pot Support certain foods can be cooked quickly over the chimney of the Kelly/Volcano Kettle as it boils thus ensuring maximum fuel and time efficiency. Note: as the heat is intense, you will need to stir your food regularly. During transport, this Cook Set stores neatly inside your Kelly Kettle ensuring maximum space saving.